Do you experience chest pain, upper back pain, shoulder pain, radiating arm pain or thoracic outlet syndrome, wrist pain, and/or hand pain? If so, you could have angry scalenes. Scalene muscles are involved in several common pain problems in the neck, chest, arm, and upper back. 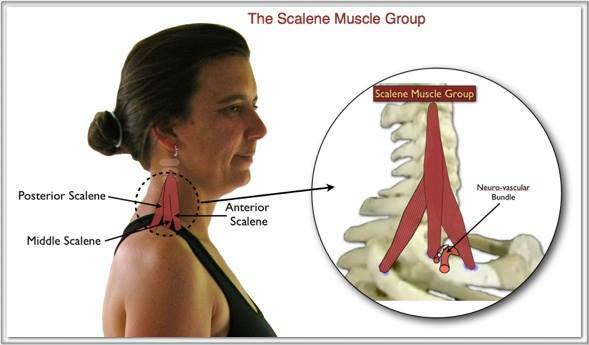 The scalenes are the lateral neck muscles that help you inhale, rotate, flex your head forward & move your head from side to side (bending your neck to bring your ear down toward your shoulder). During any given day a person will eventually assume a forward head posture- driving their car, sitting at their desk, use their cell phone, Ipad, or computer, etc. This posture can potentially compress the brachial plexus, which is the network of nerves that originate in the neck and feed into the armpit region and down into the arms. A brachial plexus impingement can lead to a number of problems from numbness in the hands, to thoracic outlet syndrome or carpal tunnel like symptoms. This is only the tip of the iceberg. Add in trigger points and these little muscles can create a whole lot of havoc! AND, if the scalenes tighten on one side, you can find yourself with an elevated shoulder. This unilateral shortening can be caused from a leg length discrepancy, whiplash injury, bad sleeping habits, excessive coughing from a cold, swimming, or even from carrying large objects around like a purse, bag or back pack. Think you may have tight scalenes? Call us. We Can Help!